Photon management in solar cells embraces all strategies to enhance the absorption of sun light in a given solar cell by an assistive structure. This would allow to enhance the efficiency. Basically two approaches can be distinguished. On the hand, the spectral composition of the light can be modified by either up- or down-conversion to mitigate losses. On the other hand, an assistive structure can be used to suppress reflection losses at the entrance facets and to enhance the optical path of the light in the solar cell. This research is extremely rewarding, since eventually our academic expertise to tame the propagation of light finds immediately an application with major societal impact. 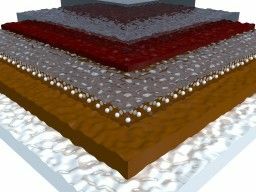 Presently, we focus in our group on studying the ability of various photonic nanostructures, such as randomly textured surfaces, photonic crystals, dielectric grating, and metallic nanoparticles to be beneficial for both of the aforementioned strategies. Primarily we concentrate on solid state thin-film solar cells, but eventually we also study organic solar cells.